Released in the summer of 2014, Planes: Fire & Rescue is an animated Disney feature that is a sequel to the 2013 animated feature Planes. It is one of the strongest animated sequels that Disney has ever put out, which is likely tied to the fact that the movies were developed at the same time as separate adventures in the life of the star of both movies Dusty Crophopper, voiced by Dane Cook. Today, November 4, you can bring the movie home as a new Blu-ray release for your whole family to enjoy. 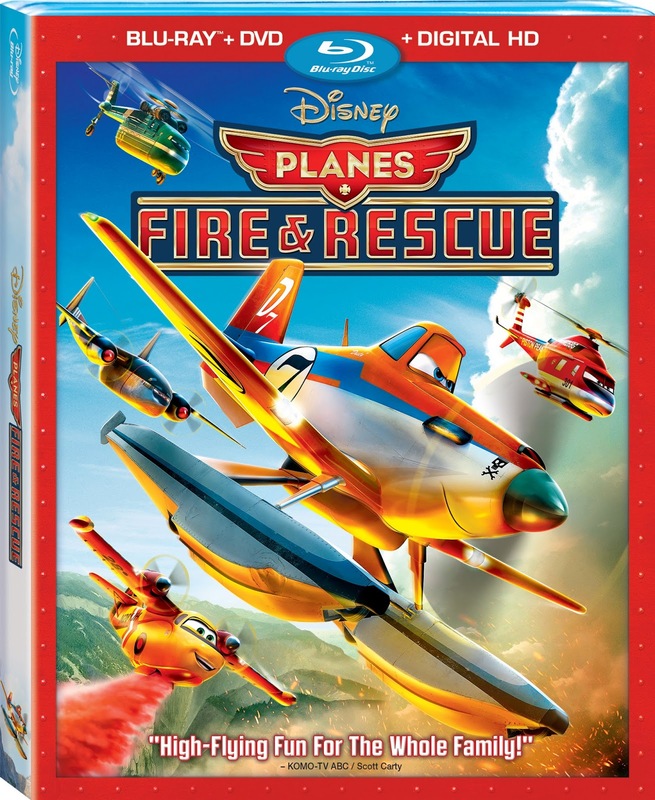 If you’d like to learn more about Planes or Planes: Fire and Rescue you can listen to episodes 137 and 189 of our podcast. When you pop in the Blu-ray and get to main menu you’ll be presented with scenes from the movie presented as moving pictures interspersed with postcards, posters, and other paraphernalia from Piston Peak National Park. It’s clever and reminds me of one of my favorite OS X screensavers. There are a few bonus features on the Blu-ray, many of which have been previously released as part of the movie’s promotion prior to it’s release in theaters. However, Vitaminamulch: Air Spectacular, is a completely new and enjoyable short with characters from the original planes movie and taking place in Propwash Junction. In it we see Dusty open an airshow for his old employer Leadbottom. Chug and Dusty excited to be seeing “Air Devil Jones” and “Vandemonium” perform a dangerous stunt at the show, but Skipper is concerned about it. The daredevils get detained and don’t show. This leads to Leadbottom dressing up Dusty and Chug as the the missing daredevils and forcing them to perform. Mayhem ensues and things end with with a crowd pleasing bang. Honkers - is a mostly unfinished and longer version of the bar scene shown in the movie. The basic difference is we see the outside of the bar, and learn that it was named Honkers. Dusty’s Dream No More - this is a storyboard animated scene where Dusty is feeling sorry for himself and goes back to his hanger to check out all his old trophies before getting inspired to test the limits of his broken gearbox. Air Attack: Firefighters From The Sky is a short about how the crew of the movie visited the Hemet-Ryan Air Attack Base in Hemet California, the home of CalFire. This is where much of the research for the movie occurred and has a focus on the smokejumpers and their training. We learn that all the new fire fighting characters introduced in the movie were taken directly from inspirations gained while visiting the base. Welcome To Piston Peak! teaches the viewer about the various landmarks and places to visit in Piston Peak National Park. “CHoPs” TV Promo is the TV show introduction as shown in the movie. A music video of the movie’s theme song “Still I Fly” starring Spencer Lee. “Dipper” - in this Dipper introduces herself to the audience. She talks about who she is, and what she does for her job. She posts it as her profile on a PlanesDate.com website. “Smoke Jumpers” - in this we learn about the 5 smoke jumpers from the movie. They build a campsite to roast marshmallows, and then get called off to put out a fire. That there is not a huge amount of bonus material as can be attributed to the young age of the movie. Those looking for a good movie for their “Family Movie Night” can count on this film to deliver whether they’ve seen it already or not. Fans of the characters and/or the movie itself will enjoy that the Blu-ray also includes a DVD and a Digital copy. Overall, this is a fairly standard Blu-ray release for a new movie.